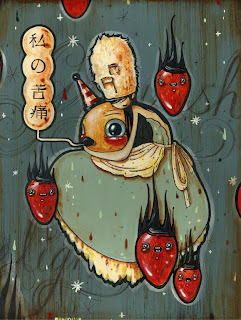 ‘Run Rabbit, Run’ is the first solo exhibition at our gallery from Los Angeles-based artist Brandi Milne. 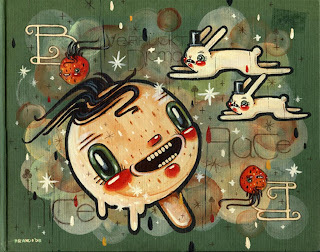 ‘Run Rabbit, Run’ will feature a new fantastical world of whimsy painted with acrylic on wood panels and a collection of hand-painted antique books that will make up a very special installation. 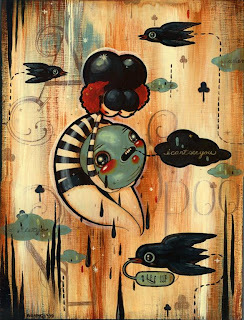 Born and raised in Anaheim, California, Brandi Milne always had a love for creativity. Growing up, she was happily influenced by the oddities of the 1970’s and 80’s, vintage Halloween decorations, classic cartoons and an abundance of nostalgic child playthings. 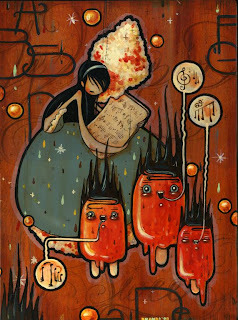 A self taught artist and illustrator, Milne’s work represents a melding of many very different genres while embracing beauty and aesthetic over message or propaganda. 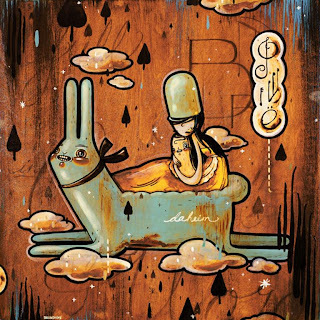 Milne has shown at numerous galleries throughout California including Corey Helford Gallery, CoproNason, Gallery 1988 LA and SF, and La Luz de Jesus. Brandi also recently wrote and illustrated her first book, “So Good For Little Bunnies”, which was published by Baby Tattoo Books. Plans are already underway for her next book project as well. Please talk a lil’ bit about the general idea/vibe behind your new series of works for ‘Run Rabbit, Run’? The idea and feeling behind this body of work is strongly related to my mother’s passing in March ’08. My work is emotionally narrative (not by choice), and because I’m struggling through this huge loss, it’s reflected in my new works. I’ve tied in the show’s theme ‘Run Rabbit, Run’ – a lyric from Pink Floyd that hit hard for me one day while I was listening to Dark Side of the Moon, and really feeling my mom’s absence. It struck a note with me, and opened up this idea in my mind. This was the inspiration for my new show, and in turn, extremely helpful in my heart. There’s been a shift in your technique over the past couple years that has really given your latest works a vintage look & feel. I think this has really breathed a whole new life into your work. You’ve made many great strides in your style and the mediums you create with, care to elaborate a bit on some of the new techniques you have been incorporating into this new body of work? My techniques have drastically changed in the past few years as I moved from working in an illustrative style to that of a more painterly style. I used to work on paper/illustration board with watercolors, pencil and ink in order to keep things REAL tight and clean. I used to hold my breath whenever I worked, and my poor hand would cramp up because I was so pressed for perfection. Over time, I couldn’t stand feeling like a mistake would set me back the entire piece – I wanted to be free. Painting on wood was my ticket out of that stress filled bind I was putting myself in, and I took the leap a few years back, scared as hell! But since then, that freedom is the rabbit I’ve been chasing! My earliest memories of creating art was coloring books. It was always special to me, all the hours I spent coloring, looking at the drawings, choosing which ones I preferred to color and why. I remember I loved the pictures with thick lines, and would scribble out the thin-lined drawings in a rage! My mom was really good at making (us) feel better if we were sick by having my dad bring home a new coloring book and a new box of crayons – the big box! In the morning/day I guess. It used to be at night, and still my mind won’t shut up when I lay down to go to sleep. Maybe that’s it, my mind works all night with ideas and visions and when I wake up, I can’t wait to turn on some musica and get to work! Let’s see…well, my girls are an endless narrative for me. She’s my way of voicing an emotion in a piece, sad, innocent, scared. The happy characters around her are flash and silly like the world we live in. The strawberries I draw are symbolic for my heart, or the hearts of people that I love. There’s a lot of strawberries in my recent work, for obvious reasons, they’re really special to me right now. Wildest dreams? Um…I like to rub pig noses. I like dog noses and cat noses too, but pig noses are my favorite. What? I just finished reading Kat Von D’s book High Voltage Tattoo and Ghosts/Aliens by Trey Hamburger. Both books ruled. I need to finish my work and then I’ll have more time to read. Yes, I have to listen to music to set me free!!! Pink Floyd really does it for me, as I mentioned before, but I also like Elton John (old classic Elton), Led Zeppelin, America, Tenacious D, and so on. Music is my foundation for creating. It’s key. Speaking of music, I know you also play the guitar – any favorite songs to play? Ever thought of bringing the two worlds together and creating a soundtrack for one of your exhibits and/or performing at one of your exhibition openings? You mentioned to me recently that you’ve been working with Hurley – can you elaborate on any details yet / future plans? 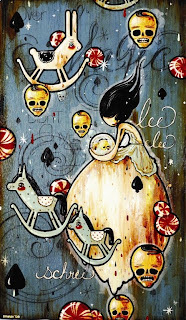 I did some tee shirts with Hurley for the fall ’08 line of my “Alice In Wonderland” & “Patina” paintings. They also have a wonderful online artist feature that I’m part of along with other awesome artists like Jason Maloney, Bob Dob, Todd Schorr, Lola, Chet Zar, Greg Simkins and lots more. Yikes, this one’s hard. 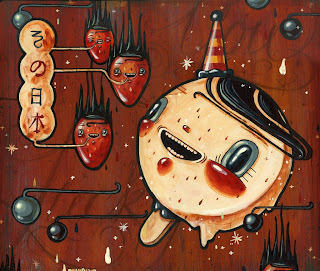 I never seem to get a grasp on describing my work, so I just say it’ s surrealistic, sloppy, old-time-fun, pop, paint on wood. And then people nod and smile and say “OH, yea, I think I know what you mean”, but they don’t. If I had to chose one, I would say Camille Rose Garcia. Her work is special to me because it’s neverending insane. Her colors blow my mind and her stylings are impecable. She’s a jewel. What have you got coming up in terms of shows and projects after ‘Run Rabbit, Run’? 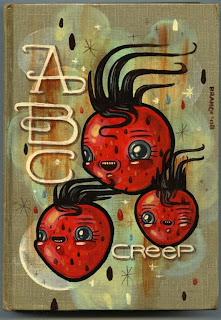 I will be having my next solo show at the Corey Helford Gallery early 2010, I’m working on my next book with Baby Tattoo Books, a few features in magazines including Hi-Fructose and an exciting collaboration is in the works with Gallery 1988 and one beautiful rock star couple – so keep an eye out! If people walk away with one thing gained from seeing one of your exhibits, what would you hope that would be? I hope that people go away with a feeling of warmth, love and hope. A large number of Easter eggs will be hidden about the gallery (both inside and out) for patrons to hunt for and discover. 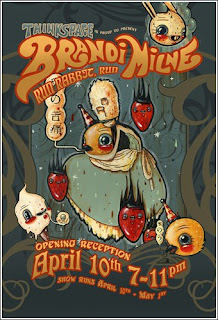 Each egg will contain a special ticket, good for one of many prizes to be redeemed that evening, including the grand prize, a framed one-of-a-kind original drawing from Brandi herself. Other prizes will include copies of Brandi’s latest book with Baby Tattoo “So Good For Little Bunnies”, copies of her new Gelaskins, and much more.